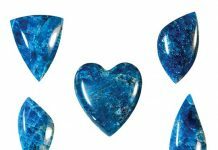 Central Oregon, with its great variety of lapidary material, has been a destination for rockhounds for decades. The juniper-covered mountains, canyons and mesas were the center of intense volcanic activity during the Miocene Epoch. 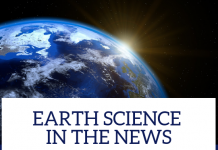 Over several million years, the hotspot that now resides beneath Yellowstone Park provided the heat source that gave rise to extensive rhyolite lava and ash eruptions from numerous volcanoes. These silica rich ash and lava deposits are now the source for a large variety of agates, jaspers, thunder eggs, and petrified wood that rock enthusiasts eagerly seek. One locality, the Richardson Recreation Ranch, has been a prime collecting area for over 50 years. Richardson Ranch is a working cattle operation of several thousand acres. 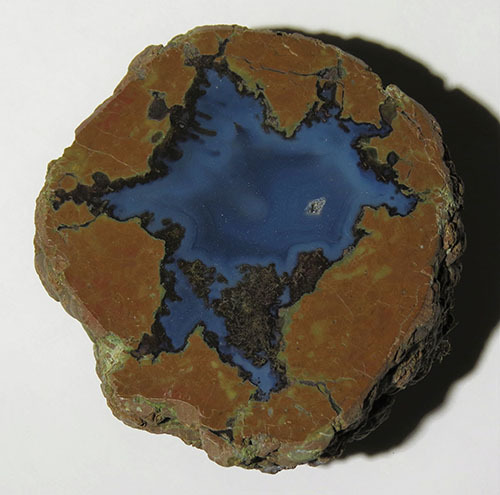 Unlike most of the ranchers in the area, the Richardson family decided long ago to diversify and make the many occurrences of agate, jasper, and thunder eggs found on their property accessible to the general public. 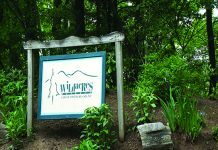 Besides developing their own rock resources, they also opened a fully stocked rock shop that offers equipment—some of which they designed themselves—and rough rock from all over the world. Quality rough from all over the world lies in well-organized outdoor piles in the ranch rock yard. Chickens and peacocks frequently hold court in this area. For many years my wife, Kerry, and I have driven past the sign advertising the ranch northeast of Madras, Oregon, on state Route 97 on our way down to the Bend area to visit friends. On occasion, I’d stopped by to check out the rough rock they had for sale and purchase tumbling grit and other supplies. For one reason or another, I had never taken the time to actually explore the ranch and its rock riches. 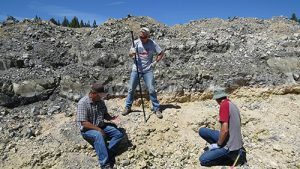 That all changed in the summer of 2016, when the Yakima Rock Club, of which I am a member, scheduled a multi-day collecting trip to several localities in the Madras and Prineville areas. As luck would have it, the first stop on the schedule was Richardson Ranch. The dates we selected for the trip were at the start of a whopping heat wave. When our caravan pulled into the parking lot of the Richardson Ranch rock shop, the temperature was already pushing the high 80s. It was obvious this day was going to be a cooker. We went into the office and signed in for the trip by filling out a registration card. We were then given a map of the ranch with the different digging areas marked, information on which ones were currently active, and the status of the roads. One of the perks of digging at Richardson’s is they can provide digging tools and buckets for eager rockhounds who come ill prepared. The area we chose to dig at was some eight miles from the office. The roads are mostly well-maintained dirt that wind through valleys and over juniper-covered ridges. These roads are not accessible after rains, and the owners inform you of this, denying access if they are questionable or impassable. A word to the wise: If you are traveling in a caravan of several vehicles, lead the pack if you can. The dust stirred up can be substantial and brought to mind the old saying, “Eat my dust”, which I did, as my truck was near the back of the pack. Our first destination was the South Blue Bed. This thunder egg bed is in a valley at the base of a flat-topped mesa composed entirely of massive rhyolite lava flows. The layer where the eggs are found is an ivory-colored, sticky clay that is capped by a tough, reddish, cherty rhyolite. 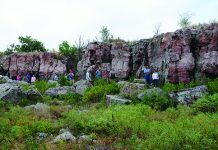 Sections of this rhyolite cap had been bulldozed away, exposing a long strip in the wall of the quarry where eggs could be more easily accessed. All of the overburden from decades of digging had been pushed aside in huge piles, giving testament to the enormous extent of this deposit. 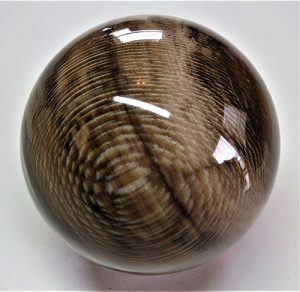 Richardson’s custom made this fossil sycamore wood sphere for Jerry Wickstrom. from past rains. The sticky, weathered rhyolite that contained the thunder eggs was right at floor level in the pit. We found that the eggs seemed to be clustered in groups or pods. Once one of these was encountered, it took no time at all to fill a bucket. This was some of the easiest rock digging I had ever experienced. As I stated before, it was a hot, cloudless day. The direct sun and reflected heat from the light-colored rhyolite in the quarry was pretty brutal. If you plan on digging at this bed in the summer, I suggest that you take along a tarp and rig something up to provide some shade. After digging in the South Blue Bed for a couple of hours, the group decided to head over to the Moss Bed and try our luck at finding the beautiful green, gold and red moss eggs this locality is known for. The map that was given to us at the office was very accurate and the roads to the different digging areas were well marked. The Moss Bed geology is completely different from that at the South Blue Bed. The cap rock in this quarry, to me, resembled anthracite coal. It was very tough and glassy black to dark-gray rhyolite that seemed to have been baked by high temperatures. The layer the eggs were found in was below this cap rock in a lighter-colored, but still tough rhyolite. Like the South Blue Bed, the overburden had been previously bulldozed off to expose the egg layer. Digging at this locality required pry bars, sledges and wedges. Unlike the thunder eggs from the Blue Bed, which were nearly round, those from this bed were more biscuit-shaped with a rough exterior. With some concerted effort, we were able to fill a couple of buckets in a few hours. The eggs I decided to keep from this site all showed bands of mossy inclusions in a clear to slightly bluish, translucent agate. 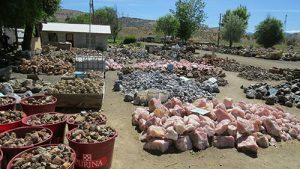 As the day wore on, the heat and the effort needed to hammer through the tough rhyolite overcame our enthusiasm, so we decided to pack up and head back to the ranch office to check out and pay for the goodies we had collected. Our departure was delayed, as a solo rockhound had inadvertently lost her car keys while exploring the Moss Bed. We spent nearly an hour helping her retrace her path, but before panic set in, the errant keys were found buried in tailings from one of holes she had dug. A disaster was averted and a sigh of relief was breathed by all. When we returned to the ranch office, Casey Richardson weighed the buckets of specimens on a large, old scale that resides outside the entrance to the office. The fee of $1.25 per pound was very reasonable, and everyone came away with as much rock as they wanted. Howard Alexander, Jerry Wickstrom, and Richard O’Brien take a break from pounding through the tough, light-colored rhyolite while searching for the eggs in the Moss Bed. After that, we checked in to let them know that we returned from the day so our names could be crossed off the registrations we had filled out earlier. The Richardson family have a very informative website (richardsonrockranch.com) that provides a wealth of information about ranch operations, driving directions, rock prices, lapidary equipment and supplies, and other pertinent topics. Besides all of the rough rock they have for sale, they also offer custom sphere making, using your material or theirs, and custom sawing. After returning home, I set about cutting the eggs from both beds we had dug in. To speed up the process, I did all of the initial cutting on one of my 24-inch saws. Thunder eggs from the Blue Bed were just cut in half and flat lapped. I cut the eggs from the Moss Bed in half, perpendicular to the long axis, and then glued the half sections to blocks of wood so that they could be slabbed and used to make cabochons. There are so many different localities on the ranch that one could spend several days exploring without hitting them all. 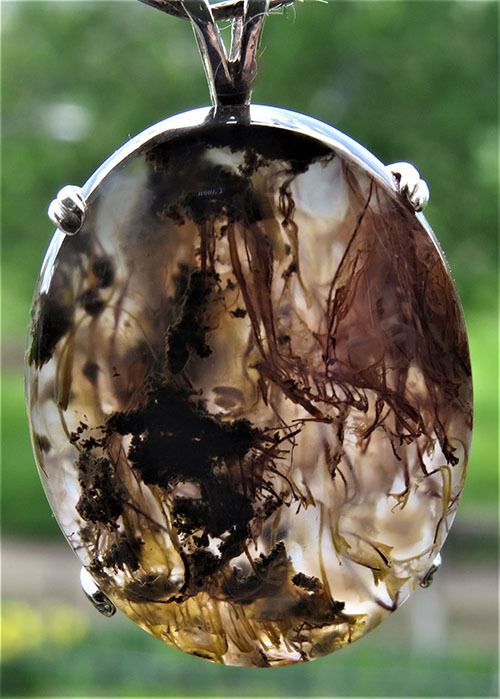 Besides six or more distinct kinds of thunder eggs, there are ledge agate and jasper. The Richardson Ranch is also home to the famous Priday plume agate. 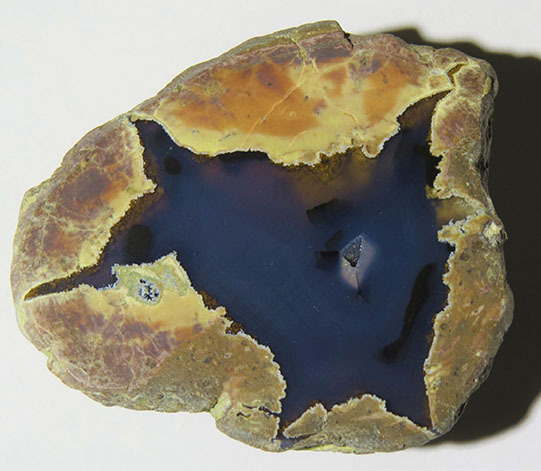 This material, which was found in one of the thunder egg beds, is rare now, but is occasionally offered for sale when old collections from estates are broken up. I am unsure if the bed where these prized eggs were found is still open for digging or if any of them can still be found. That would be a question to ask the Richardson family if you decide on visit their place. Various bands appear within a Blue Bed thunder egg from the Richardson Ranch. Priday Moss Bed eggs have delicate filaments that can be green, red, or gold. 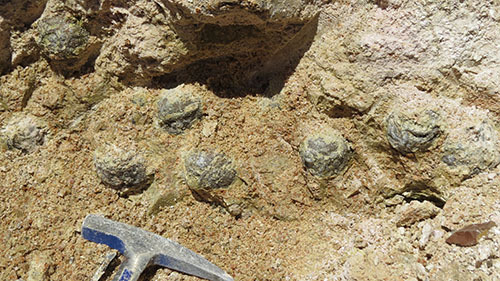 Once a nest of Blue Bed thunder eggs has been found it is quite easy to fill a bucket in a short period of time. Nine eggs are showing in this photo. 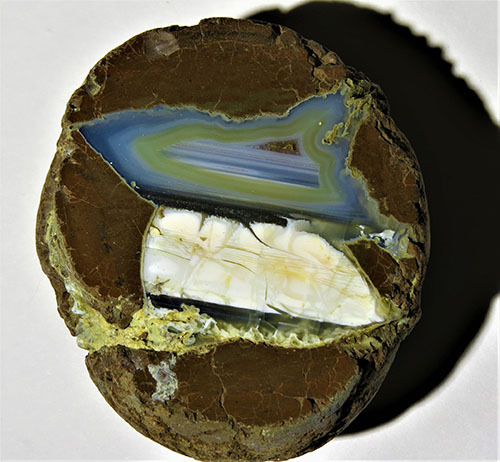 Another example of a blue-tinged agate within a Blue Bed thunder egg.